We are real fans of Solitaire games ourselves: we've been playing these celebrated games since the time when we all had office jobs, and we're still playing them now! Our love of the game is partly why we created SpiderSolitaireOnline.com. On the website we offer all sorts of Spider Solitaire games we have developed ourselves, as well as those created by other developers. You can play the games online there and then, there's no need to download anything. The games have all been created in HTML5 software, which means you can play them on all your favorite devices, such as tablet, phone or laptop. The aim is to clear all the cards from the tableau in as few moves as possible. You do this by placing cards of the same suit in a column in descending order from king to ace. This is the basic aim of the game: how you get there is described in the detailed Spider Solitaire rules. Little is known about the history of Spider Solitaire. Most variations of Solitaire are pretty old and some of them have even been around for centuries, but Spider is a fairly new game. It got its name because you have to make eight complete series to resolve the game corresponding to the 8 legs of a spider. 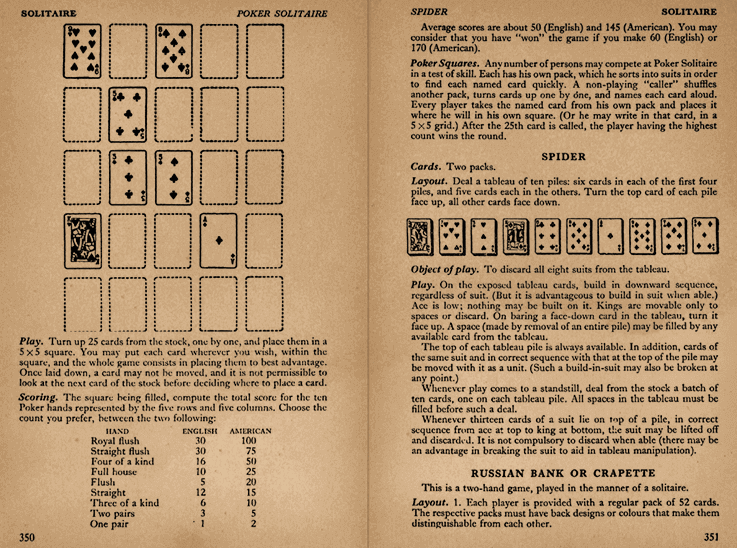 The first time the game was mentioned is in 1917, in “Culbertsons Card Game Complete with Official rules” (see photograph) written by Ely Culbertson who was a celebrated American bridge player himself. It is not clear whether he also invented the game. What is clear is that no one would have heard of Spider Solitaire if Microsoft had included it as part of the Windows 98 Plus package in 1998. The game became known around the world as of this date, all thanks to Microsoft. The game was steadily improved over the years, the animations got better and faster and more and more new options were added. They also added new, more appealing playing cards. It's said that Microsoft itself never had any idea that these types of games would be so successful. 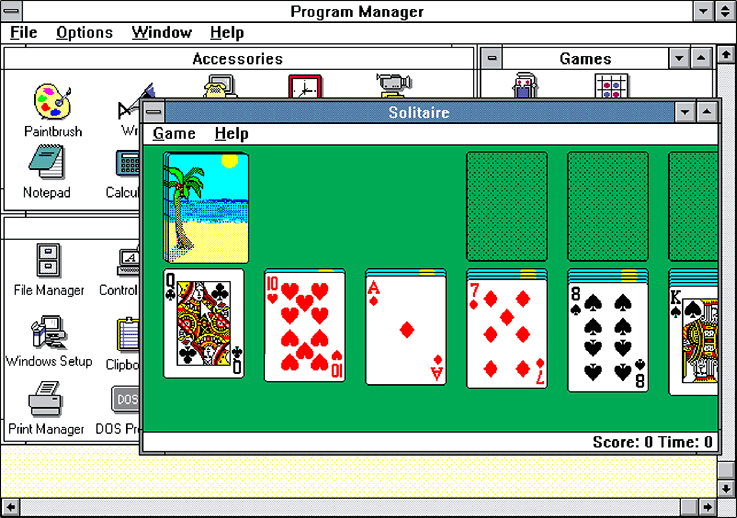 They added the game Klondike Solitaire to Windows 3.0 - brought out in 1990 - to help users get used to using a computer in a fun, easy way. Before the advent of Windows most computers were keyboard only machines and so very few people had ever seen or used a mouse. The solitaire games had an uncluttered design, restful to the eye, and were a bit addictive so they were perfect to help people get to know their way round this new phenomenon.